Superior Signal Company Inc. has provided training smoke to the fire fighting industry for over 50 years! 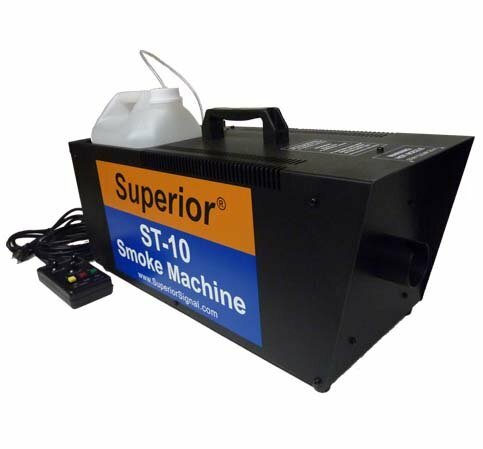 We know what you need in a smoke machine, and the ST-10 is it! With a powerful 1500 watt heating core, and reliable high pressure piston pump, this machine delivers an impressive output of 4800cfm, at a price affordable for any department. The ST-10 will quickly fill your training area with dense, persistent, non-irritating smoke with excellent obscuring power. The ST-10 comes standard with a 10 meter wired remote control which makes operation easy. No more searching for controls in a smoke filled room. This hand held remote features a selection for manual, or self timed (unmanned) operation.Simply set the dial to control flow rate, duration of smoke blasts, and interval between blasts. The ST-10 will fill the area with smoke at a steady constant rate, therefore reducing the chances of over concentration and residues. Thermal Cut Off, Prevents "Wet Smoke"
If you have any questions about this product by Superior Signal, contact us by completing and submitting the form below. If you are looking for a specif part number, please include it with your message.